Well the big two drew bookend posts, Arrogate Post 1..California Chrome Post 12. We have already discussed the short run into the first turn and it's disadvantage to the outside posts. So normally, with all things being somewhat equal this would be bad for a horse. With Chrome, who has serious speed he should be ok imo. He was going to go out anyway (for the lead)...There could be a chance he gets floated wide but his superior speed makes that doubtful. Horse racing is obviously very unpredictable but it has trends we almost look at like facts. Usually Post 1 is not a desirable post with all things being equal. Horses can get boxed in and shuffled back as the outside horses look for prominent position. Usually if they have speed and Arrogate does, they are almost forced to go out. Arrogate set a track record at Saratoga from Post 1. What I am saying is that it looks like BOTH will have to be gunned to the lead going into a quick turn from the starting gate. Trust me this is to the delight of the rest of the field. It gives them hope imo. The next question a handicapper is weighing is who will have the lead and who will be the stalker from close up. In the Classic, Chrome had an easy lead but he seemed to wait on Arrogate who caught him in DEEP stretch at 10 Furlongs. This race it COULD be the other way around. Both horses have shown they can win on the lead or stalking off the lead. It remains to be seen if they break clean and what the jocks will do. My gut feeling is they cannot be too patient at all at 9 Furlongs. It will be an all out GRUELING pace and it COULD be a suicidal speed duel. I don't think either horse wants the other running within themselves as Chrome did in the Classic. Remember, even though Arrogate caught him Chrome was still the winner at the 9 F mark in that race,. They will have to put pressure on the leader almost immediately. I will be searching for a horse capable of picking them up. I am not sure yet such a horse exists in this race. Such is the talent level the big two have over the others. Arrogate drew the rail and California Chrome the far outside in a field of 12 when posts were drawn on Monday for the $12 million Pegasus World Cup on Saturday at Gulfstream Park. Art Sherman, the trainer of California Chrome, rolled his eyes when California Chrome got post 12. "Well, at least, we won't have to be in the starting gate too long," he said. "Oh gosh, here we go again." Arrogate was first and California Chrome second when they met in the Breeders' Cup Classic in November. Arrogate had the rail when he won the Travers. He left quickly that day to hold position. California Chrome will have to break quickly from his post, what with a short run to the first turn going 1 1/8 miles. "We'll take it to 'em," said Alan Sherman, Art's son and assistant. "Ain't gotta leave nothing in the tank." This will be California Chrome's final start. California Chrome is the 6-5 favorite on track linemaker Jay Stone's morning line, with Arrogate 7-5. The field, from the rail out, is Arrogate, Prayer for Relief, Neolithic, Noble Bird, War Story, War Envoy, Shaman Ghost, Semper Fortis, Keen Ice, Breaking Lucky, Eragon, and California Chrome. A good article for those interested in California Chrome and his future career as a Sire. Being a very modestly bred horse and a California State Bred (not really one of the supreme breeding states) many thought Chrome would have little interest to the big money breeders. This article states he already has 120 mares booked so he is off to a great start. HALLANDALE BEACH, Fla. -- The only reason California Chrome is running Saturday instead of already being at stud is that the Pegasus World Cup at Gulfstream Park will be the richest race in the world, with a $12 million purse. He could win a $7 million first prize. The only reason California Chrome will head to Kentucky on Sunday morning is that the breeding season is about to commence, and mares have been booked, many of them owned by those involved in the current ownership group, California Chrome LLC, precluding any further starts. But the day is growing closer, believes Frank Taylor -- whose family's Taylor Made Farm co-owns California Chrome and will stand him at stud -- that prize money on offer for the best horses will be more than most horses can make at stud, which will help keep those horses on the track. With the Pegasus at $12 million, the Dubai World Cup at $10 million and the Breeders' Cup Classic at $6 million, that's a robust triple. As of Saturday, California Chrome will have run in all of them in the past 10 months. In fact, Taylor said the California Chrome partnership in recent months strongly considered racing the horse through 2017. "A few guys didn't want to do it," he said. "He has 120 mares booked." Taylor said he called the racing authorities in Dubai to see whether the purse for the World Cup could be increased to $15 million. "I said, 'Surely, you want to bump it to $15 million,' " he said. "You don't want the Americans to outdo you." It remains at $10 million. Taylor said keeping California Chrome in training or breeding him came down to a "risk-reward situation." "We can breed him and make $6 million," Taylor said. "If we run in all these races, he could earn $15 million, but he'd have to win all those races and stay in training for the year." Taylor said there was no chance of postponing stallion duty until after the Dubai World Cup because by the time California Chrome would return from that trip, it would be April before he could be bred to mares. "We'd either have to run in Dubai and then race all year or go to stud now," he said. "You can't do both." For too long, the economics of the sport have made it far too risky to keep a valuable horse on the track as opposed to going to stud. The Pegasus offers another reason to stick around. "You've got the Breeders' Cup, the Pegasus, Dubai," Taylor said. "You get one more, like at Saratoga between Dubai and the Breeders' Cup, something in August, that could get it going," Taylor said. "A lot of these studs would not go to stud if they're still sound. "These races can change the dynamic. California Chrome would have gone to stud last year if it wasn't for Dubai." Saying goodbye will be hardest for those who have been around California Chrome for nearly four straight years, like trainer Art Sherman. It's especially difficult for them when they see the condition California Chrome appears to be in as he nears the last, and richest, start of his career. "This horse is getting better and better," Sherman said. "I'd love to have another year. Two-time Horse of the Year California Chrome has been set as the 6-5 top choice to win Saturday's inaugural running of the $12 million Pegasus World Cup at Gulfstream Park. On paper, Prayer for Relief doesn't seem to belong in the same zip code as California Chrome and Arrogate, let alone the same starting gate. "It's kinda sad. He's a once-in-a-lifetime horse. It's been a hell of a ride. I watched his work on Saturday and said, 'Give me one more year, please.'" He'll have to settle for one more race, and a potential $7 million first prize. Second place in the Pegasus is worth $1.75 million, third $1 million. The field for the 1 1/8-mile Pegasus was to be drawn late Monday and was to feature a rematch between Arrogate and California Chrome, the 1-2 finishers from the Breeders' Cup Classic. Their 10 rivals were to be Breaking Lucky, Eragon, Keen Ice, Neolithic, Noble Bird, Prayer for Relief, Semper Fortis, Shaman Ghost, War Envoy and War Story. Three horses will be listed as also-eligibles -- Madefromlucky, Sea Raven and Stanford. According to David Fiske, racing manager for Ron Winchell, who co-owns Gun Runner, an attempt was made to enter Gun Runner on Monday but the entry was rejected by Gulfstream Park owing to requirements the track has put in place for horses stabled at Fair Grounds because of the equine herpesvirus situation at the New Orleans track, where Gun Runner is stabled. Gun Runner would have taken the place of War Envoy in the slot owned by Mick Ruis. Well I finally got the Racing Form and put about an hour of homework in. I'll be looking more during the week but first look is always a sobering thing. When you see the race with the post positions set up and Figs (figures) it starts to become real. Reality sets in. Sometimes light bulbs go off in your head but you always try to temper those feelings. You don't want to get ahead of yourself. You want to be instinctive but you also want to keep it real. There is money involved and when the time comes for you to put that money up, whatever amount you decide on, you don't want to be second guessing yourself if at all possible. I mean, you always do anyway in the back of your mind but you need to stay strong with what your homework and gut feeling came up with. That's a successful handicapper. After that he reels off 5 in a row. The next three wins were at 1 1/16th of a mile. Two wins on the front end and one stalking close up to win. This horse looks very special on paper. All three of those wins were fast averaging about 1:41 a solid time....After that he had his best two races at 1 1/4. First was the track record in August at Saratoga where he went wire to wire on the front end from Post 1. He was running with the best 3 year olds and won by 13 lengths! Then came his tour de force in the Breeders Cup Classic, again at 1 1/4 running down the best horse in the world, The Dubai World Cup winner California Chrome! You've heard me say Chrome did not get the best ride BUT, he had a pretty easy first 1/2 mile all alone (47 seconds)..NOBODY thought Arrogate would get Chrome off that relatively slow pace but he did. In part because Chrome's jockey had TOO much respect for him and kind of waited. He knew he was coming so he tried to save some horse in Chrome. It was a mistake imo. Also in part because he had 10 Furlongs to catch Chrome and needed every yard just getting him near the wire. You've heard me say Chrome would have been the winner at the 9 furlong mark, the distance of the Pegasus. It should also be noted though that Arrogate was as far back as 5th, the jockey wisely saving some horse himself and he needed to. It was a remarkable ride all things considered. It should also be said that Arrogate raced wide much of the way, giving up valuable Real Estate and STILL got it done...IMPRESSIVE! A handicapper doesn't just look at the Figs but he reads in between the lines too and he weighs and measures against the other horses. For instance Arrogate has raced on 5 different tracks in just six races. That is the mark of class to win at different tracks. Of course Califronia Chrome is very well traveled himself. It must be said that Arrogate was either a late developing horse or he was injured as he did NOT race as a two year old. That's why he was not in the Triple Crown races. He just wasn't ready. Many times young horses have minor injuries that keep them out. Some serious injuries too. Sometimes it's just a slow developing horse, either depending on what month he was born or just needing time to fill out and find himself. All horses have their birthday on Jan 1 (Arrogate now 4) BUT, some are born in March or before and some in May or after..A big difference in young horses. That's why many just don't make the Kentucky Derby. Of course you have to be good enough too. That goes without saying.. So all Arrogate's races were at age 3. Six starts is a VERY lightly raced horse. Contrast that to the 6 year old War Horse and Champion California Chrome who DID race at two and nearly won a Triple Crown at 3 taking the Derby and Preakness and running a close 4th in the 3rd leg, The Belmont Stakes. He has also done a lot since, becoming the ALL TIME money earning horse at 14 million$$. He can add 7 million to that with the winners share of the 12 million dollar purse. BTW Each horse will get at least $250,000 back out of the 1 million they all had to put up. So it's the maturity and greatness of Chrome against potential younger Super Horse and already great Arrogate! In this race Arrogate WILL get the Acid Test! Especially considering it's only 9 furlongs which on paper favors Chrome and the fact that Chrome is racing fit coming off a 12 length tightener for this race against lesser able horses. Arrogate has been idle since Nov. 5th (classic) where as Chrome ran that prep on Dec. 17th! Again, normally it would be advantage Chrome BUT..when we are talking about Superior Horseflesh like Arrogate and HOF trainer Bob Baffert who has declared him fit, what you have is a giant headache for a handicapper lol. One that we live for though. Trust me this race cannot get enough superlatives with these two. It will be One for the Book regardless what happens. Even if they are both upset! The next post I do will be Chrome. We will go from Post 1 to Post 12 and then during the week I will lay out the rest of the field along with the many possible scenarios. Stay tuned and thanks for tagging along. Hey, just because there aren't a lot of Replies doesn't mean the posts aren't valuable. I skim FT's posts to learn what I can about the goings-on in the racing world. I can't always contribute anything because I simply don't know as much as FT. I figure some day when FT wins the multi-million dollar jackpot, we can look back at his posts to learn his betting strategies! A total of 35 posts on this thread. 27 of them by Folsom Trails. I think Camay has a valid point, and he didn't say it in a malicious manner. Keep up the good observations, Cal. We all appreciate you! First off I'd like to thank Ken, (folsom gardner) for bringing back some order and decency to the thread. I would also like to thank BCF for the kind words and those who have been reading about California Chrome and this HUGE RACE coming up. This was never about me. It's about a great rags to riches horse who has many fans world wide. Especially here in Cali where he was bred. This is his final race. His swan song. Back to the race. First let me say I had a rough night at Red Hawk lol and have not slept yet so while I am still hopping mad at losing half my bankroll for the race, lets get to it. I still have about $150 to play with. California Chrome is the modern day Carry Back. He was the very modestly bred horse who won two legs of the Triple Crown like Chrome in 1961. I think they bought him for $1,500 then and he went on to humiliate all the Blue Bloods even beating 5 time HOTY and legend, The Mighty Kelso. Chrome won HOTY despite his loss because he won 7 of 8 including Dubai, then the worlds richest race. Its not easy for a horse to ship there and win. Chrome also had a solid 2nd in Dubai in 2015. So his only blemish is Arrogate's win and imo he should have won that one. Many feel that way but we cannot try to diminish Arrogate who if he beats Chrome again will be put alongside the likes of the Immortals, Secretariat, Kelso, Frankel, Affirmed, Forego, American Pharoah, etc etc. There are about 25 - 30 immortals. The same for Chrome who if he gets revenge for his Classic would catapult him perhaps into the Top 10 of all time. It would also be unreal for the stud business that would come his way. That's how the game works. Horses pass their genes ability wise more so than human do. Of course when you are a great it's tough for the offspring to live up to the old man. Secretariat is a case in point. He did well but did not produce another Secretariat. There can only be one of he anyway. Chrome drew Post 12 and he MUST go out FAST or he risks getting floated wide on that quick turn that comes soon after the break. Being so close in ability the slightest mishap or excuse will bring down one of the big two. Longines World Rankings has Arrogate and Chrome 1 - 2 as the worlds best in that order. Arrogate at 134, Chrome at 133. Imo this looks like it will be a Match Race inside of a race. THAT is dangerous as i have said. They have no choice though really. Noble Bird, another with speed may play a role and you COULD see the big two stalking him..FOR A SHORT WHILE...It might be like cat and mouse. That might actually be better for both instead of a suicidal speed duel. Not that there is much behind them in the way of picking them up BUT..In racing what goes up must come down. Or better said, what goes out must come back. And that's what happens. The leaders actually come back to the field after expending themselves and shortening stride. What does Trails's Gut feel? I think Arrogate, stuck on the rail will GUN for the lead and FORCE Chrome to challenge Match Race style. Both will fly past Noble Bird who cannot step for long with these. I feel If Chrome tries to get the lead under this scenario he will lose. In other words Chrome, coming from the outside must settle right off the flank of Arrogate and stalk. It's a bit weird because I think that while BOTH have stalking ability I would prefer Chrome be on the lead for his sake. Remember in a Match Race the leader usually wins. That's history as I showed in an earlier post. IF the post positions were reversed I would have to say no way Chrome loses. Especially at 9 furlongs. Especially that he is Racing Fit while Arrogate is coming up to the race off just workouts. The race IS one for the book because all these elements have everyone's head spinning. 10 horses will be salivating with their potential suicidal speed duel looking to pick up the pieces in deep stretch. IF Chrome goes ALL OUT and gets the lead you will see Arrogate come right to him on the backstretch. He CANNOT afford to wait as he did in the 10 furlong Classic. I think Arrogate will win in that scenario to be honest because Chrome will have to expend valuable fuel from the outside and into that turn. How Does Chrome win? Well first he hopes Noble Bird will go for the first 1/4 mile with Arrogate as he settles into position 3rd. As Noble Bird drops back Chrome MUST POUNCE right then and not give a breather to Arrogate. He must slingshot past him probably at the top of the lane (stretch)..I believe Chrome wins that way. If you see any other scenario such as either horse opening up and winning by open lengths then it is a case of Superior Horseflesh. Plain and simple. Chrome has already shown his greatness. The book is still out on Arrogate despite his victory. In other words Arrogate, still lightly raced may not yet have come into his own. He may just be the better horse. A bona fide monster. Chromies say blah to that but we'll see. It's Game On Big Time! I will give a rundown on the rest of the field in the coming days. There just might be an upset possibility but in all honesty, judging from my first look the big two would HAVE TO set it up with a suicidal duel. And that is a strong possibility...Thanks again for the interest and stay tuned. I just want to throw a few things in I missed late last night. Actually early this morning. My head was still buzzing somewhat and I may have said a few things I want to make clear. For one I said Chrome's only blemish was the loss to Arrogate not realizing some here are not in the know on racing and his career. What I meant was in 2016 that was Chrome's only blemish. I never laid out his lifetime record either as I did with Arrogate. Chrome has had 26 starts with 16 wins, 4 seconds and 1 third. In the money 21 of 26. A great record but obviously he has been beat and can be vulnerable in this race as he was in the Classic last November. I should also say his 3rd was in the 2014 Classic and he also has a 4th in the Belmont Stakes. This is a REAL War Horse who is well traveled. Do the math and you see a few out of the money races but some were as a two year old and some due to coming off layoffs due to injuries. In fact, after his two year old year he was out of the money just once. That in the Belmont Stakes!!! Interesting article in the Racing Form. Take what you will from it but also consider that most owners, trainers and jockeys most of all that have a top horse ALWAYS use superlatives and tend to be the glass is half full kind of people. However I don't think there is too much wishful thinking with Arrogate. Arrogate, with Dana Barnes up, trains over the Gulfstream Park track on Wednesday morning. HALLANDALE BEACH, Fla. – Arrogate took off from California on Tuesday as the Eclipse Award-winning 3-year-old of 2016, and runner-up to California Chrome for Horse of the Year, but by the time he had arrived here at Gulfstream Park for the $12 million Pegasus World Cup on Saturday he had been declared the best horse in the world in ratings published by Longines and the International Federation of Horseracing Authorities. 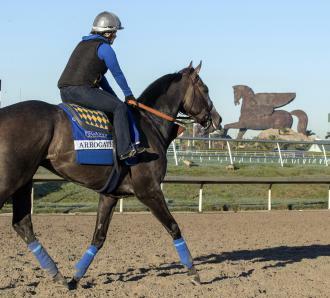 “They can have Horse of the Year, we’ve got the best horse in the world,” Jim Barnes, the assistant trainer for Arrogate, said while laughing Wednesday morning. For a horse who has run a mere six times, Arrogate has rocketed to stardom under the care of Barnes and his boss, trainer Bob Baffert. While Arrogate was so far under the radar coming into the Travers that he was dismissed at 11-1, he was the close second choice to California Chrome when Arrogate won the Breeders’ Cup Classic, and those two will vie for favoritism Saturday. Among currently active racehorses, they are a surefire quinella. California Chrome outpointed Arrogate for Horse of the Year, Arrogate outpointed California Chrome in the international rankings. But while California Chrome is retiring from racing after Saturday, Arrogate is scheduled to race through the end of this year. And based on how he has progressed in recent months, it’s certainly conceivable that Arrogate has more to give. His 2017 campaign should be compelling. Arrogate smoothly settled into his routine at Gulfstream Park on Wednesday morning, gliding around the track under exercise rider Dana Barnes – Jim’s wife – as though he’d been here for a month. “He always floats. That’s how he goes,” Dana Barnes said. Arrogate appears to have developed physically since the Travers, even the Breeders’ Cup. “He looks like he’s gotten taller,” said Jim Barnes, who said Arrogate was weighed recently at a robust 1,178 pounds. The factors that have contributed to Arrogate’s rapid rise are threefold. Baffert patiently delayed his debut owing to sore shins at age 2; had he pressed on, it might have been counterproductive. Arrogate has a lung capacity at which jockey Mike Smith has marveled. And Arrogate has become far more sensible in his training, which Baffert credits to the daily routine with Dana Barnes. “We changed riders, put Dana on, and got him to settle down,” Baffert said. Arrogate has not had an ideal training schedule heading into this race, owing to the wet weather that has plagued Southern California in the past month, a situation California Chrome avoided by heading here earlier. But Arrogate got his works in, and Baffert is convinced Arrogate is ready. Training for a major race off a lengthy layoff is in Baffert’s wheelhouse. Both Arrogate and American Pharoah won the Breeders’ Cup Classic without a race following the Travers, and Baffert is bringing Arrogate into the Pegasus without a race following the Breeders’ Cup, whereas California Chrome had a paid workout in the Los Alamitos Winter Championship. Baffert entered Arrogate in the San Pasqual at Santa Anita earlier this month, but finally decided not to run owing to wet weather, though his heart was never fully in it. The time off, Smith said, may be beneficial for the Pegasus. The race is at 1 1/8 miles, a furlong shorter than the Breeders’ Cup Classic, and Arrogate drew the rail, so he’ll need to leave alertly to avoid having traffic fold over on him. Coming into the race without a prep “puts him on the sharper side,” Smith said. Smith said Arrogate runs the turns well, which will be important at a track like Gulfstream. The biggest advantage Smith may have, though, is that Arrogate never seems to tire. After both the Travers and the Breeders’ Cup Classic, Smith was amazed at how quickly Arrogate shook off the effort. Try all you want, but it's going to be very difficult to make chicken salad from the chicken whatever that was 2016 Horse of the Year California Chrome's draw of the 12 post in Saturday's $12 million Pegasus World Cup going -- quite notably -- 1⅛ miles at Gulfstream Park. Since the rebuilt Gulfstream opened in 2006, Posts 9 through 14 in 1⅛-mile races there have a combined 10 wins from 223 starts, for a paltry 4.5 win percentage. The only other post with a single-digit win percentage at this distance is, not surprisingly, Post 8, which has an 8 percent success rate. For purposes of comparison, 16 percent of starters from Post 1 and 18 percent of starters from Post 3 have won going nine furlongs at Gulfstream. Recent results show these figures have remained consistent. Since the opening of the prime winter meet on Dec. 1, 2012, Posts 9 through 14 are a combined 2-for-50 in 1⅛-mile races at Gulfstream for a win rate of 4 percent. Posts 1 and 3 over this period had respective win rates of 15 and 19 percent. In two-turn main-track races at the current Gulfstream meet, Posts 8 through 14 are a combined 0-for-25. Specific to Post 12 going 1⅛ miles at Gulfstream, the only horse to win from that slot since at least the beginning of 2006 was Big Brown in the 2008 Florida Derby. California Chrome looked as good as ever in that final workout, effortlessly flying through five furlongs in 58.91 seconds, and galloping out six furlongs in 1:12.41. These are some daunting numbers, and California Chrome, the 6-5 morning line favorite, must do some serious work early in the Pegasus if he is to avoid losing an amount of ground on the first turn that even he might not be able to overcome. Some have opined that California Chrome is quicker than everyone to his inside until you get to Noble Bird, who breaks from Post 4. But I'm not so sure. Stretch-out horses like War Envoy and Semper Fortis could contribute to hanging California Chrome very wide on the first turn. Arrogate, who beat California Chrome in the Breeders' Cup Classic, and who is the second choice on the morning line at 7-5, drew the rail. That is obviously a world's better post than California Chrome drew, yet it might be a tricky one for him. I'm not sure Arrogate has as much pure early speed as some think, and I feel he might have to be sent if he is to avoid getting shuffled back into the first turn. Keen Ice has won just 2 of 19 races with one being a Maiden win (that's where you run against non winners until you win and graduate into winners ranks) but has earned over 2 million $ placing in some big races.... His claim to fame is his Travers victory over Triple Crown winner American Pharoah at age 3. He has just turned 5 years old. That year he was not close to Pharoah in all 3 TC races. He got closer running second in the Haskell after the TC races and then took advantage of a suicidal speed duel at Saratoga to win the Travers. That day American Pharoah and Frosted, a highly touted 3 year old that year COOKED in a speed duel and Keen Ice picked up the pieces to nail the TC winner at the wire. That's exactly what they want to repeat in this race and it could easily set up. Remember they put up a million $$ to try. But he will have one less furlong here too and that hurts a closer. Pharoah went down that day at the Graveyard of Champions as Saratoga is known due to legendary horses losing up there. Man O' War and Secretariat among them. In fairness to him he was just coming off winning a grinding TC series, the first horse to do it in 37 years! He had to be drained and tired some what. He even had another win after that before the Travers ( Haskell) and Keen Ice was coming into his own. That and the speed duel made it possible for the upset. Since that huge upset Keen Ice has been out of the money in 5 races but he does have two 3rds and one 2nd, his last race, in fact in December...So perhaps he is coming into his own again and perhaps he will get the same scenario on Saturday. I can tell you a lot of people like this horse and he will be a solid 3rd choice. He may even be bet down below his 12-1 Morning Line. I should also say that he ran 8th beaten by 6 lengths in Dubai when Chrome won. He also was beaten By Arrogate and Chrome in the Classic after that. This time losing by 11 lengths though he was 3rd. Remember, there was no speed duel in that race. Arrogate nailed Chrome all on his own with no help up front. Keen Ice needs that help and may get it. I gave this horse his own page because logic says he probably has the best shot based on his Class (running against good ones) and his style to pull off the upset. Personally I don't want to throw anyone off this horse if that's who they want to play. However I don't see it happening. I think if the big two go down it will be a rank outsider to do it but please don't listen to me. It is a possibility. Check out Keen Ice's claim to fame...I think I can use just one page to give a rundown of the rest of the field, later on today. Noble Bird...Did win a Grade I race (top level stakes horses) but he is more at a Grade II and Grade III level. Of all the horses in the race i'd be SHOCKED if he won this. That's because of his style though and the fact he will be up front with two monsters. He really is a nice and useful horse otherwise but here he is in over his head. He has 7 wins in 20 starts. Prayer for Relief...This old 9 year old War Horse has had 45 starts with 8 wins, 6- 2nds, and 10- 3rds. He has run with some good ones and won 4 in a row at age 3. He has even raced in Dubai, unsuccessfully though. Now at age 9 this is just a dream. Noble Bird and Shaman Ghost beat him by 16 and 33 lengths in his last two. Can't recommend. 50-1 ML will probably end up at 100-1! That's the field. I have enjoyed giving you all the rundown. I'll probably post again Fri or Saturday before the race with any news and let you know how I play my $150 bucks. For me this race is much more important as a fan. Sure I would like to win money too but I won't trip if not. I usually go with longies but here I may be forced to use the top two in exotics with a few others and hope to hit something like an exacta 5 or even 10 times. We'll see. Good luck if you play and enjoy the race on Saturday if you watch. It is a historic event. Owners have never put up cash like this before. Some MUST think they have a shot unless they consider a million $ peanuts. And believe me for some in here it is peanuts. For those interested in this unique concept. What happens tomorrow will determine whether or not this race continues. Whatever happens we are indeed fortunate to see the clash of these two monsters and those looking to take them down. Also, Andy who sees Arrogate as unbeatable is downplaying what having the rail from Post 1 and the draw backs of that could be...IF he gets off even a half step slow from the break he stands to get boxed in and shuffled back so HE TOO will have to use valuable fuel at the break...In fact even breaking normally Post 1 is vulnerable to those who go all out from the outside like Noble Bird, Chrome or any Kamikaze horses we talked about in an earlier post. Also he said Chrome had a dream trip in the Classic and still lost BUT, he fails to say that was 10 furlongs and this is 9, where Chrome was the winner at that mark despite not getting a great ride...Another thing Andy failed to mention. EDIT....Just want to say to those who watch Andy Serling above..when he talks of Chrome beating inferior horses last out by 12 lengths he is showing the wrong race as he speaks... The one you see was actually this past summer against a good field and you can see Chrome did not win by 12. In his last at Los Alamitos it was an inferior field but Chrome raced extremely wide to stay out of trouble thus giving up ground before drawing away by 12. I would have shown it to you here but strangely can not find it anywhere.